Workers in Ontario received another blow from Premier Ford this week, after his government passed Bill 66. The bill means employers no longer need approval from the Ministry of Labour if they want their employees to work more than 48 hours per week or want to reduce overtime pay. Now, workers will receive even less protection when being pressured to work longer for less pay. We are extremely concerned as we know it is already difficult for workers to refuse a schedule that exceeds 48 hours — even though that is our right on paper! Many workers tell us when they phone the Workers’ Rights Hotline that they are being made to sign contracts agreeing to excessive hours before they are even offered a job. That means workers end up agreeing to work upwards of 60 or 70 hours, for fear of not getting hired at all. Now with Bill 66, our labour laws got even weaker. If our government was “for the people,” they would make it easier, not harder, for workers to access protections. But under Bill 66, employers will no longer have to post a simple Employment Standards poster in the workplace. This poster tells workers that they have rights and is available in multiple languages. What the government is really doing here is sending a green light to bad bosses to ignore workers’ rights. This is unacceptable! The Ford government’s shameful attack on workers’ rights needs to stop. 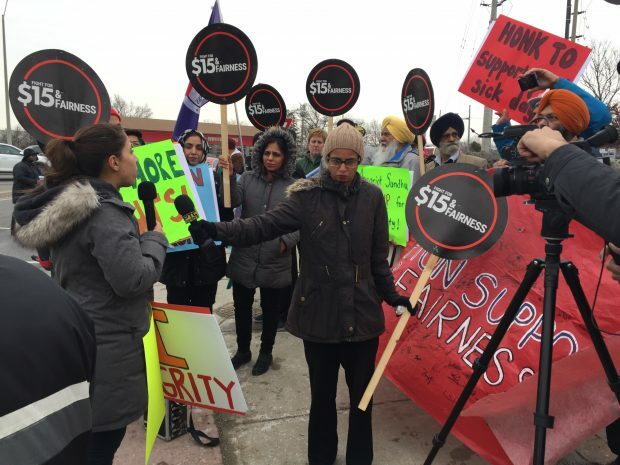 The same day Bill 66 got passed, a report from the Financial Accountability Office added more evidence in support of the $15 minimum wage that Premier Ford cancelled. Had $15 kicked in on January 1st 2019, 1.3 million Ontarians would have received a $810 boost (after-tax). But, under Ford’s so called low-income tax credit, 62% of minimum wage earners get nothing while those who are eligible get only about a $400 tax-credit. You can read the full story here. Workers deserve so much better. We deserve a poverty-free wage, not a tax credit that does nothing for us. We deserve the ability to say no to excessive hours, and get proper overtime pay. Our growing movement of workers will not be silenced! With or without the government’s support we will enforce our rights on the job. The first step is knowing our rights at work. Help us spread the word in your community by sharing this message.